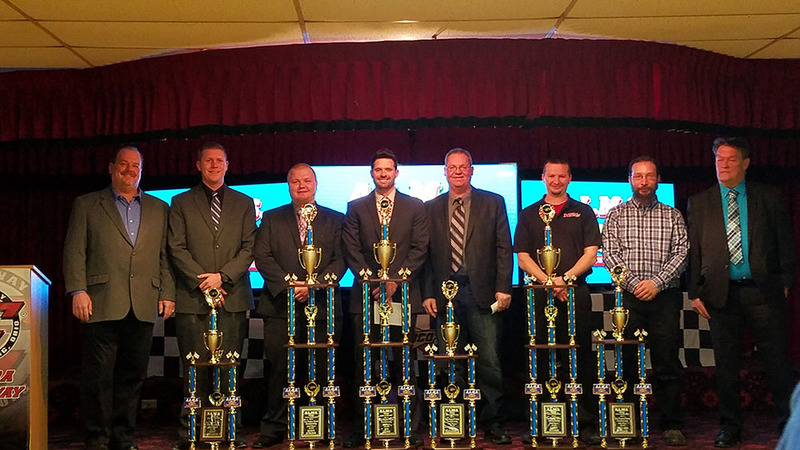 By Colby Gorniewicz – ROSSBURG, OH — Jan. 20, 2018 — The 23rd year of Sunoco American Late Models Series racing was celebrated on Saturday, January 20th during the 2017 Eldora Speedway Awards Banquet. The Eldora Ballroom, located on the grounds of the speedway in Rossburg, OH hosted the gala event as the series and hosts witnessed the crowning of the fourth champion in series history with at least three titles. Ada, OH’s, Jon Henry was celebrated in front of the massive crowd as the 31-year-old took over the points lead after a second place finish on June 24th at Fremont Speedway (OH) and hang on the rest of the season to secure his third Sunoco American Late Model Series championship to go with his 2011 and 2009 crowns. Henry’s third title run included a pair of feature wins on back to back nights. The first of two checkered flags came on September 1st at Attica Raceway Park (OH). He backed that up a night later on September 2nd at Oakshade Raceway (OH). Overall in 2017, Henry recorded two wins as well as eight top fives and 11 top 10 showings on his way to the championship in his #15 Jim Weber Motorsports / Club 29 Racecars / Dargie Racing Engines entry. Henry is also a three-time track champion (two titles in a Late Model) at the famed Eldora Speedway (OH). His two wins give him eight for his career in Sunoco American Late Model Series competition which places him tied for eighth all-time with 1999 champion, Jerry Bowersock. Now the two-time and reigning DIRTcar Late Model National champion, Rusty Schlenk finished in the runner-up spot in the final 2017 Sunoco American Late Model Series points standings. The 31-year-old standout, originally from Jackson, MI and now calls McClure, OH home scored three feature wins during the year with those coming at Oakshade twice (May 27th and August 12th) as well as one more at Fremont Speedway (OH) on June 24th. The four-time Sunoco American Late Model Series champion finished the Sunoco American Late Model Series year with three wins as well as eight top five finishes and 11 top 10s. Schlenk’s three triumphs move him into a tie for fourth all-time in career wins with fellow four-time Sunoco American Late Model Series champion, Brian Ruhlman. Both have 24. Rounding out the podium finishers was Sylvania, OH driver, Casey Noonan who registered a single victory in 2017 as it came in the 47th running of the Johnny Appleseed Classic at Eldora on May 28th. Overall in 2017, the 38-year-old, a former two-time track champion at Oakshade, also registered three top fives and six top 10s to eclipse his highest career Sunoco American Late Model Series points finish, which previously was a fourth back in 2007. Noonan now has seven career Sunoco American Late Model Series wins, which places him tied for 14th all-time with National Dirt Late Model Hall of Fame legend, Billy Moyer. The 2009 DIRTcar Late Model National champion, Jason Feger finished fourth in the final points and recorded a single victory, which came on August 11th at Kankakee County Speedway (IL). The 39-year-old Bloomington, IL veteran also snagged three top fives’ overall and four top 10s as he finished ahead of three-time DIRTcar Late Model National champion and reigning three-time DIRTcar Summer Nationals champion, Bobby Pierce, who completed the top five. The now 21-year-old Pierce picked up a single victory as well, which came in the $20,000 to win Farmer City 74 at Farmer City Raceway (IL). That win moved Pierce to seventh all-time in career wins with 16. Overall in Sunoco American Late Model Series competition in 2017, the Oakwood, IL star also picked up five top fives and six top 10s. Defiance, OH veteran, Hillard Miller finished sixth in the final points as he recorded a season best finish of a fifth at Baer Field Motorsports Park (IN) on July 26th while Devin Shiels finished seventh with a season high showing of a second also at Baer Field. The Britton, MI driver had a banner year otherwise by recording the 2017 track championships at both Attica Raceway Park (OH) and Oakshade. 2017 DIRTcar Late Model National runner-up, Ryan Unzicker was eighth in Sunoco American Late Model Series points as the El Paso, IL standout snagged a single win, the eighth of his Sunoco American Late Model Series career which came on August 12th at Fairbury American Legion Speedway (IL). Unzicker is in a three-way tie for 11th in career wins with 2002 Sunoco American Late Model Series champion, Greg Johnson and 2012 DIRTcar Late Model National champion, Brian Shirley. Like Shiels, Unzicker also picked up a pair of track championships with those coming at Farmer City and Fairbury. The 1999 Sunoco American Late Model Series champion, Jerry Bowersock was ninth in points with a season best finish of a fourth at Baer Field. The Wapakoneta, OH veteran also picked up his fourth DIRTcar UMP Modified track championship at Eldora and fifth overall (Late Models-2001) of his career. Kent Robinson, the 2017 Eldora DIRTcar Late Model Track champion, completed the top 10 in final Sunoco American Late Model Series points. The Bloomington, IN driver finished a season best second on April 15th at Eldora and during the season, also picked up his first career DIRTcar Summer National victory at Oakshade. Drivers who scored a Sunoco American Late Model Series feature win in 2017 who didn’t finish in the top 10 in the final points includes; four-time World of Outlaws Craftsman Late Model Series champion, Josh Richards, the eventual 2017 Lucas Oil Late Model Dirt Series champion, scoring the win on March 24th at LaSalle Speedway (IL). Two-time DIRTcar Nationals Gator Champion at Volusia Speedway Park (FL), Nick Hoffman would record his first career Late Model victory of any kind, which came on April 15th at Eldora. On May 13th at Fairbury, two-time DIRTcar Late Model National champion, Dennis Erb Jr., would score a $10,000 payday. The next night, May 14th at Spoon River Speedway (IL) saw Gregg Satterlee grab his first career win in the series. On July 26th at Bar Field, now five-time DIRTcar Late Model Michigan regional champion, Eric Spangler scored his first career win in the series. On August 12th at Oakshade it was Houghton Lake, MI’s, Dona Marcoullier picking up his first Sunoco American Late Model Series victory since 2014 and third of his career. The 10th Annual Earl Baltes Classic on September 3rd at Eldora would see National Dirt Late Model Hall of Famer; Billy Moyer take the checkered flag. The final race of the 2017 racing season would be the fourth appearance of the year and the milestone 90th all-time race at Eldora. After running all of the preliminaries on October 7th, the 40-lap Allstar Performance DIRTcar Fall Nationals Feature paid $5,000 to win and took two days to complete due to Mother Nature. Pinconning, MI standout, Jeep VanWormer scored the win, the 35th of his career, to move to within one victory of Sunoco American Late Model Series all-time career wins leader, six-time series champion, Kris Patterson, who has 36 victories. The 24th season of the Sunoco American Late Model Series will see a 12-15 race schedule with the finalized schedule of events to be released as soon as it becomes official. For more information about the Sunoco American Late Model Series, the website is located at: americanlatemodelseries.com. Social Media outlets for the Sunoco American Late Model Series will be released very soon regarding the upcoming racing season. Brian Ruhlman claims his third Sunoco American Late Model Series Championship! Rusty Schlenk Crowned Sunoco ALMS Champion Again!